Tranquebar is a sleepy little town today, but in the past it would have been quite the hub for trade, intrigue and Christian evangelism. 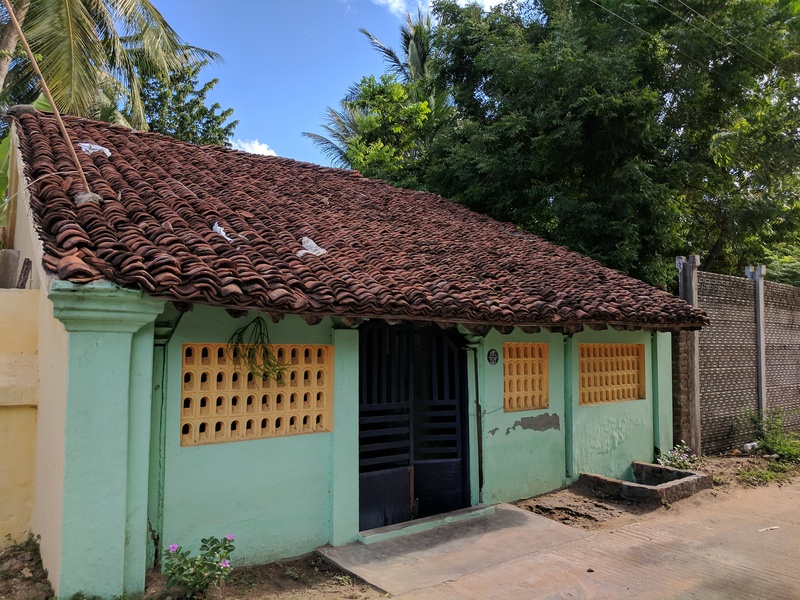 It’s official name Tharangambadi is derived from the Sanskrit Tharangam, which means song and Badi, from the Tamil padi, which means the coastal village. Some also translate Tharangambadi as “the land of singing waves”. 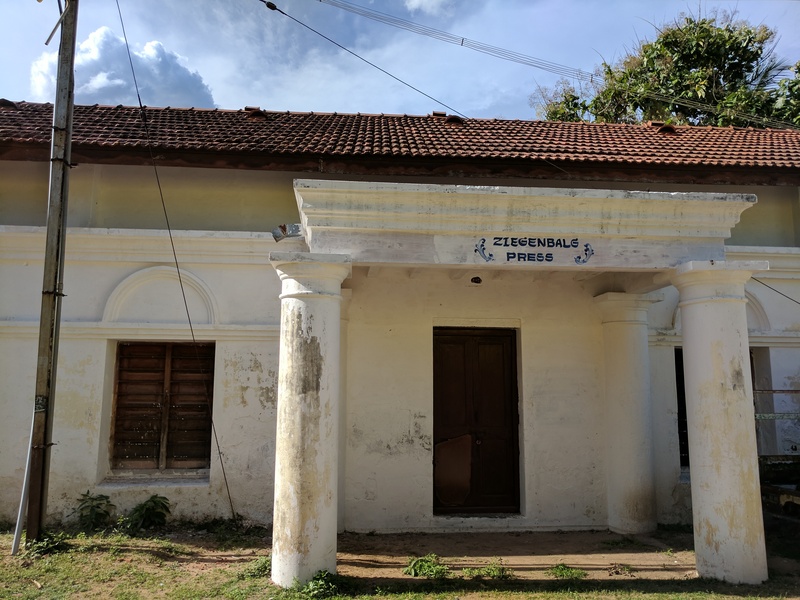 Seeing colonial style buildings, one could be forgiven for thinking that Tranquebar didn’t exist or have a history before the coming of the Danes in 1620. But that is not true for Tranquebar was part of a larger and longer history of the area going back to the first millennium and one that included both trade and as a spiritual centre. 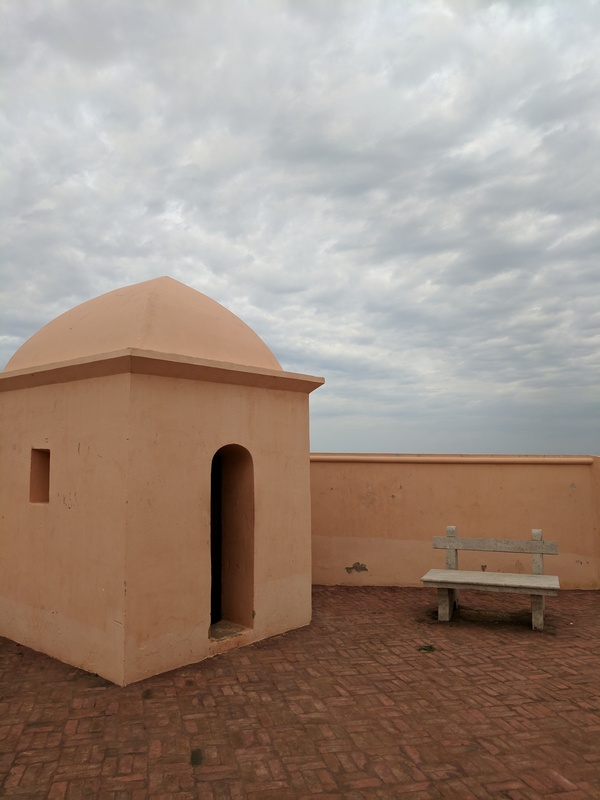 While I will not go into a detailed history of Tranquebar in this post, I will share enough to (hopefully) piqué your interest as well as set the context in understanding the Tranquebar of today. One of the earliest direct references to Tranquebar is when it was established as Sadangambadi or Sadanganpadi in 1305-1306 CE by Kulasekara Pandian. The Masilamani Nathar Temple, a temple dedicated to Lord Shiva, is one of the earliest temples to be built at Tranquebar around that time. The temple stands on the very edge of the sea-shore and is now in ruins. Locals narrate tales of how the tsunami of 2004 did nothing to the temple, but destroyed property further inland. Even today, the sea water enters the temple sanctum only during high tide. The Danes were the ones who put Tranquebar on the international map as we know it today, though when they set up the first Danish East India Company in 1616 ostensibly to form alliances (but we know what it really meant), it was with Ceylon (modern-day Sri Lanka) in mind. By a quirk of fate and politics, they ended up at Tranquebar in 1620 and were there till 1845. But it was not smooth sailing for the Danes. The 225 years of Danish rule saw the establishment and dissolving of two Danish East India Companies (1616–1650 and 1699–1729); bankruptcy in 1650; and though not directly involved, the Anglo-Dutch wars (1652–1674) for control of the major ‘Asiatic Trade’ routes, and the fallout of the Second Mysore War (1780–1784), which cut off the pepper trade and led to major losses. By 1800, the Danish trade warehouses in Tranquebar had shut down and within 20-30 years after that all the traders had left the town. 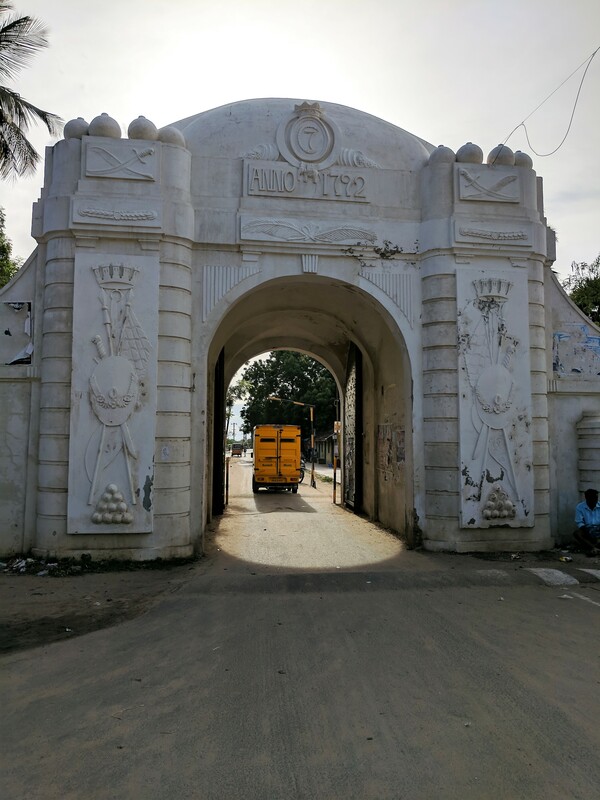 In 1845, Tranquebar was sold to the British East India Company and what little importance remained attached to the town was lost with this move. This was further hastened when the British shifted the district headquarters to the nearby city of Nagapattinam. 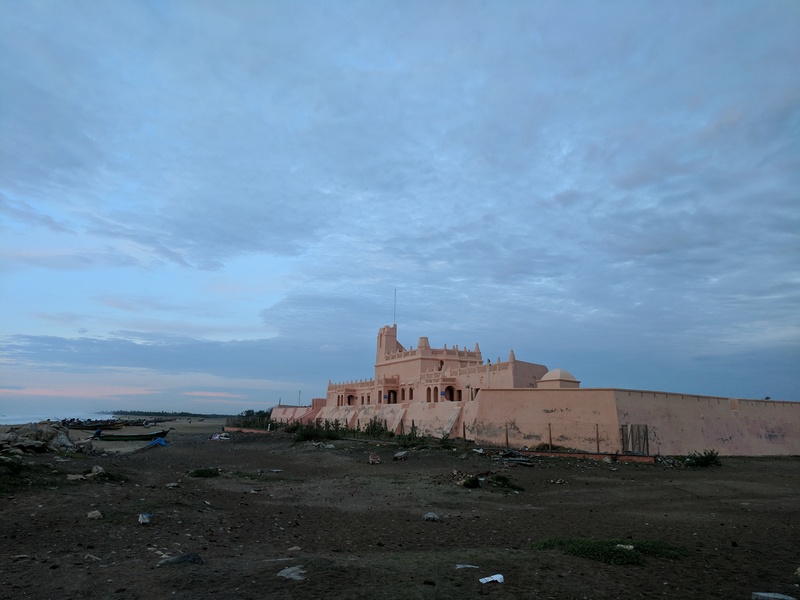 All that was left at Tranquebar by the Danes were the buildings constructed during their ‘reign’ — the oldest and most important one being the citadel of Fort Dansborg, which was built in 1620 by local labourers. Tranquebar became part of India in 1947 and went even deeper into the recesses of people’s and the state’s memories. In 1978, the citadel of Fort Dansborg came under the aegis of the Archaeological Survey of India (ASI), but other structures like the Governor’s Bungalow continued to be ignored. It took the tsunami of 2004 for Tranquebar to get some attention from India and from the Danes. 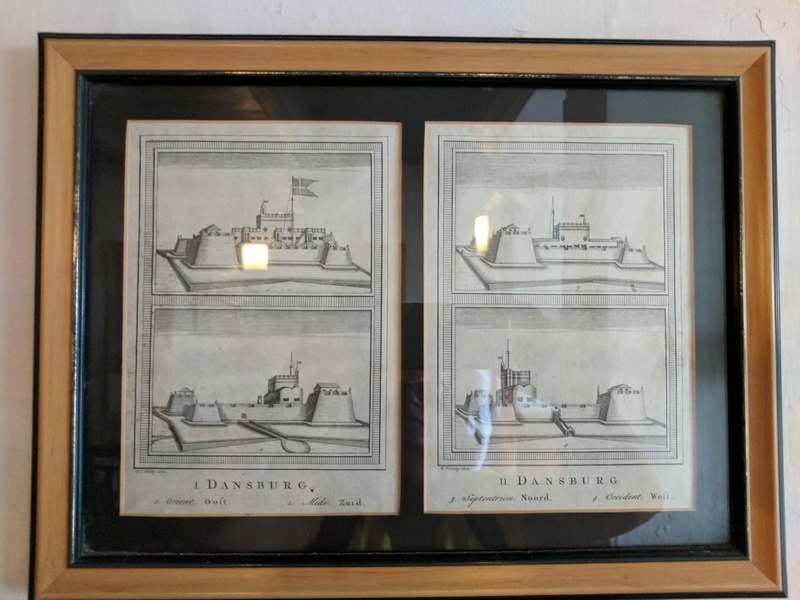 A Tranquebar Association was formed in Denmark and a plan to restore the fort was formulated with the support of several Danish institutions. 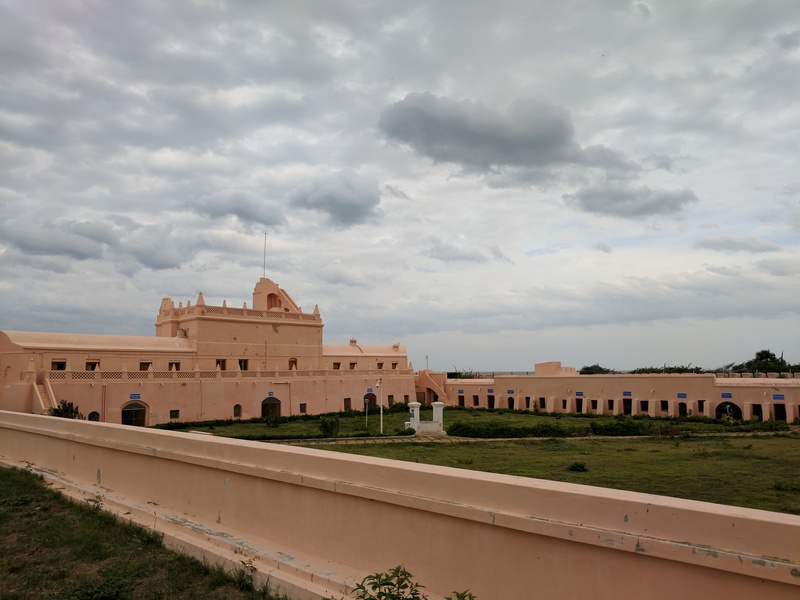 In 2005, Danish and Indian experts and volunteers, in collaboration with the ASI and the Tamil Nadu State Department of Tourism, restored the citadel of Fort Dansborg. Other built structures too got due attention and, therefore, restored or renovated. 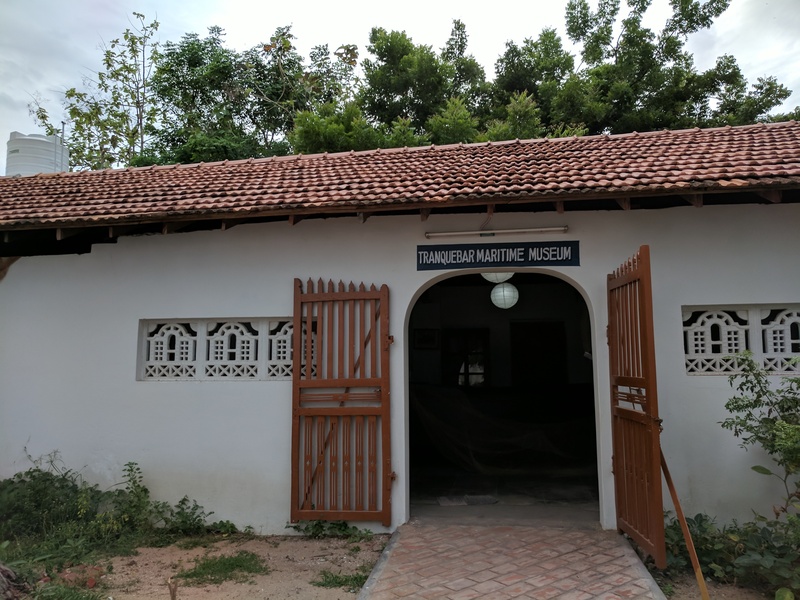 Some of them have turned into museums and souvenir shops, while some function as information centres about the Danes in Tranquebar. Click on any image to enlarge it, after which you can use the left or right arrow keys to navigate through the photographs. 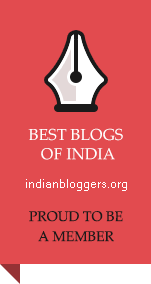 Once done, do come back to read the rest of the post. The land gate. This is the only thing that survives of the outer fortification of Tranquebar. The stones of the fortification were recycled to build houses in Tranquebar. 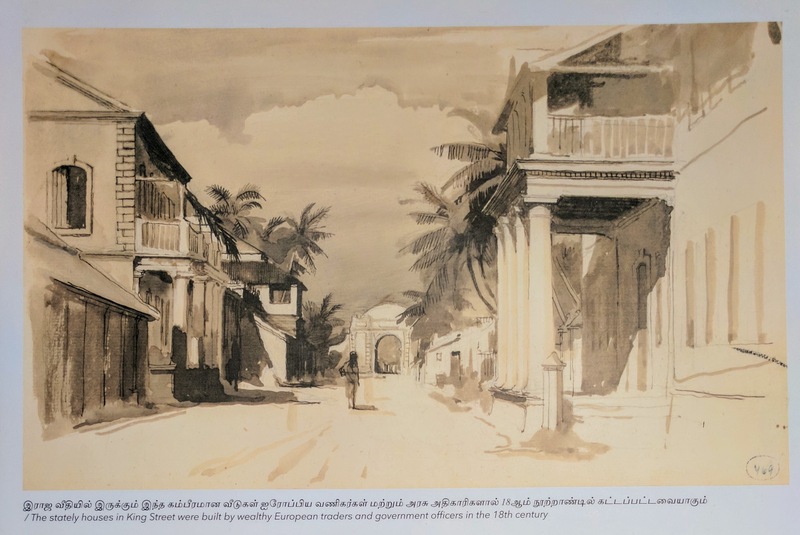 A watercolour of a street scene in 18th century Tranquebar. Note the land gate in the background. A pencil sketch of the citadel of Fort Dansborg. The citadel of Fort Dansborg in the early morning light. 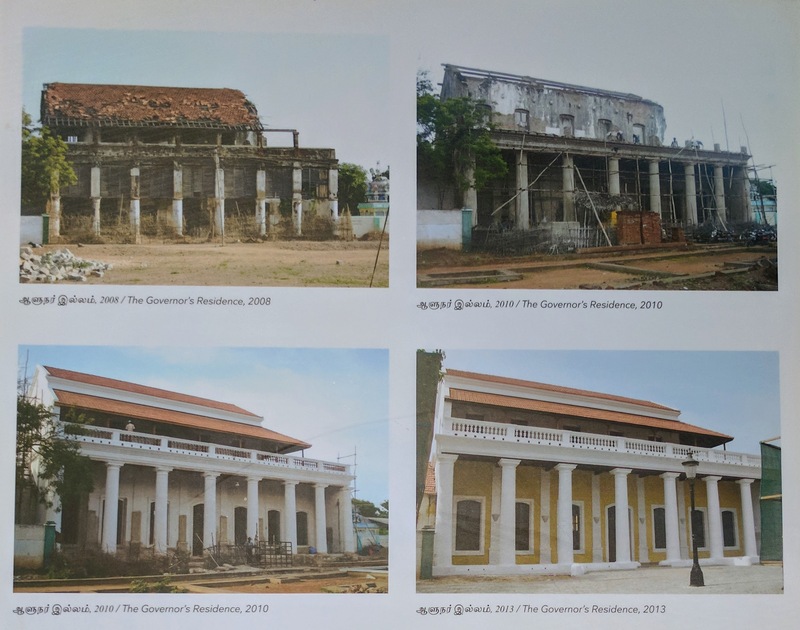 A series of photographs that document the restoration of the Governor’s Bungalow at Tranquebar. Though the design is very European, it also has vernacular features like an open inner courtyard for better circulation of air. 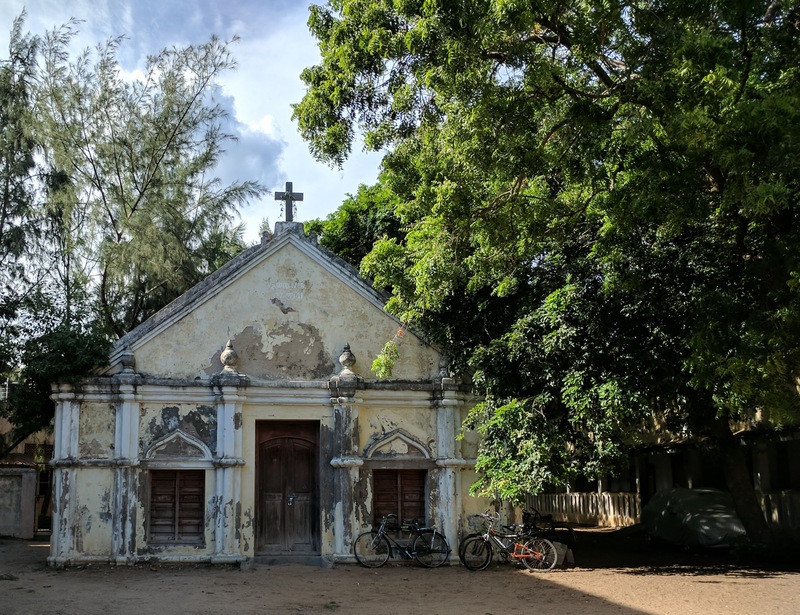 The coming of the Danes to Tranquebar for trading, brought in Christian missionaries in their wake, and by 1701 the Zion Church was built and consecrated. As long as the Danes and then the British were there in Tranquebar, only Europeans were allowed to worship there. 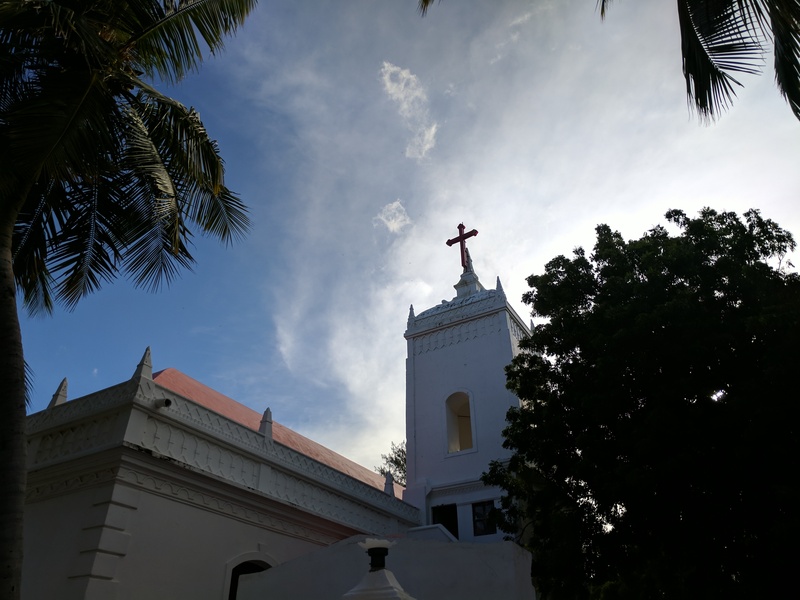 In 1706, King Frederick IV of Denmark and Norway sent the first Lutheran missionaries to Tranquebar to preach Lutheran Christian faith to the local Indian population. And that is how Heinrich Plütcshau and Bartholomeus Ziegenbalg arrived in Tranquebar on the 9th of July 1706. Today, a memorial plaque marks the spot they landed in at Tranquebar. Ziegenbalg died in 1719, and the 13 years of his work in India led to a legacy of printing, theology, learning and scholarship that continues long after the Danes and the British have gone. He is buried in the church he built, the New Jerusalem Church, and one meant for worship by the commoners. One can still see the press that Ziegenbalg set up as well as the school that is named after him. Part of the premises is now a museum dedicated to him and his work. 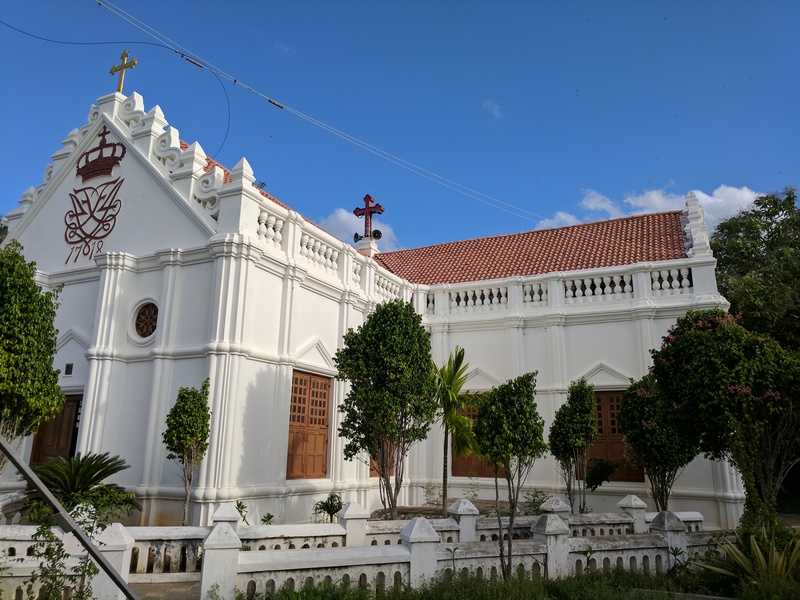 The Zion Church is considered to be the oldest Protestant Church in South India and at one time was only for worship by Europeans. The New Jerusalem Church, though built in a European design, was meant for the local Christians. Bartholomeus Ziegenbalg is buried here. A dilapidated chapel in the grounds of the Ziegenbalg school. The Danish cemetery. I would have loved to see more of this, but the gates were locked and the caretaker was nowhere to be found. I had to be content looking at the graves through the railings. The space where Zieganbalg set up his printing press. 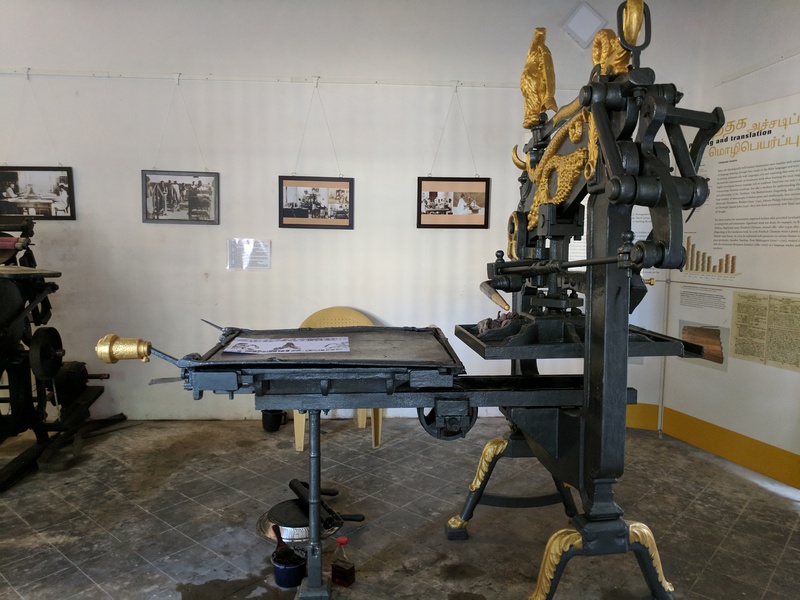 One of the letter presses. It still works, in case you are interested to know ! 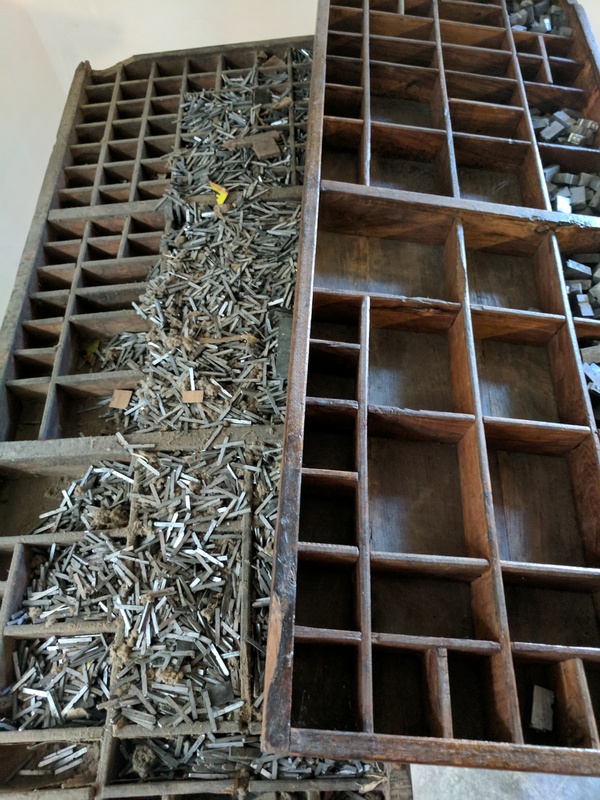 An old box full of type to set for printing. It is all mixed up now, but when in use this would have been sorted by alphabet and size ready for use. 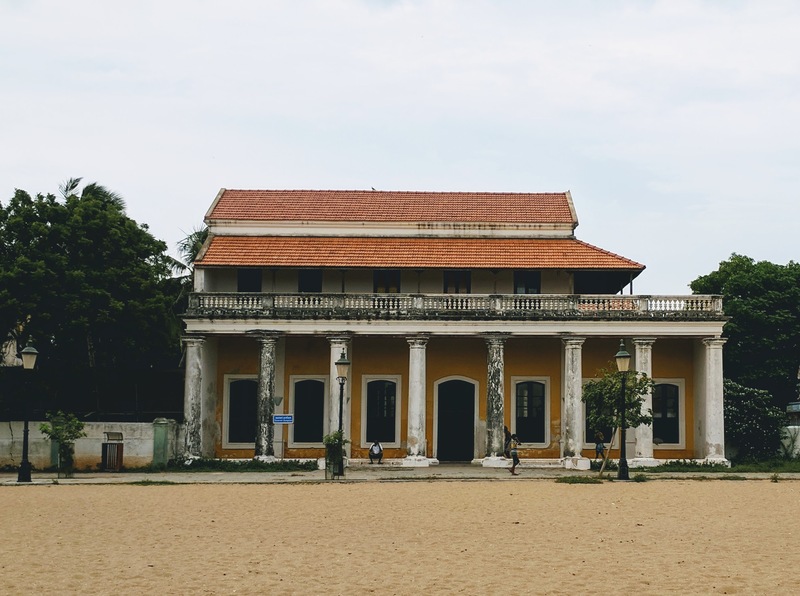 There is so much emphasis on the colonial side or the Danish heritage of Tranquebar, that it is very easy to forget or overlook that there is an Indian or local side to the town. 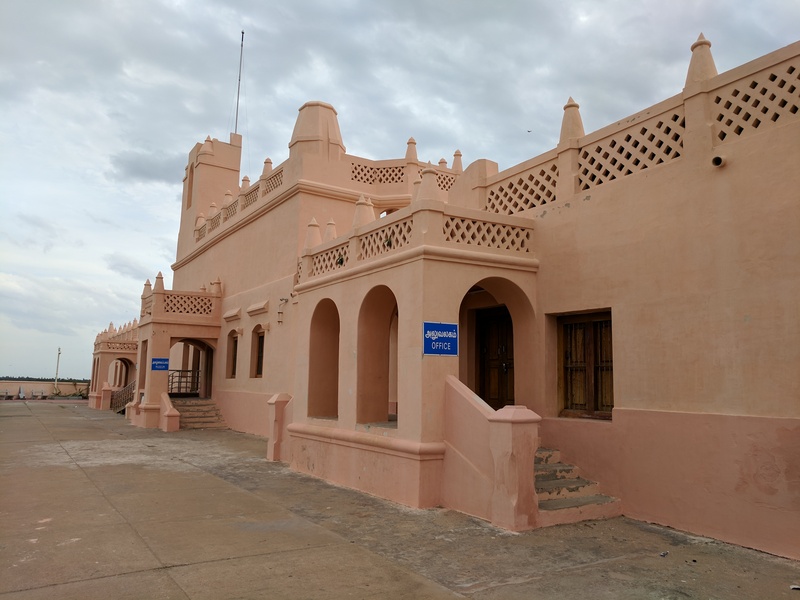 The Indian part of Tranquebar is most interesting too with the vernacular architecture and bright colours — none of the pastels or whites here. With tiled roofs and local design and aesthetics, this part of offers a refreshing contrast to the colours and textures of the Danish side of the town. A brightly painted house. I absolutely loved it. Probably the only house with whitewashed exteriors. But that blue door more than made up for it. Tranquebar revealed itself slowly to me over the 3 days that I spent there, little by little. Exploring the town’s history and its Danish past was fun, but I was surprised to find that it was the town’s present, rather than its past that I found more interesting and getting drawn to. Usually, it is the other way around. 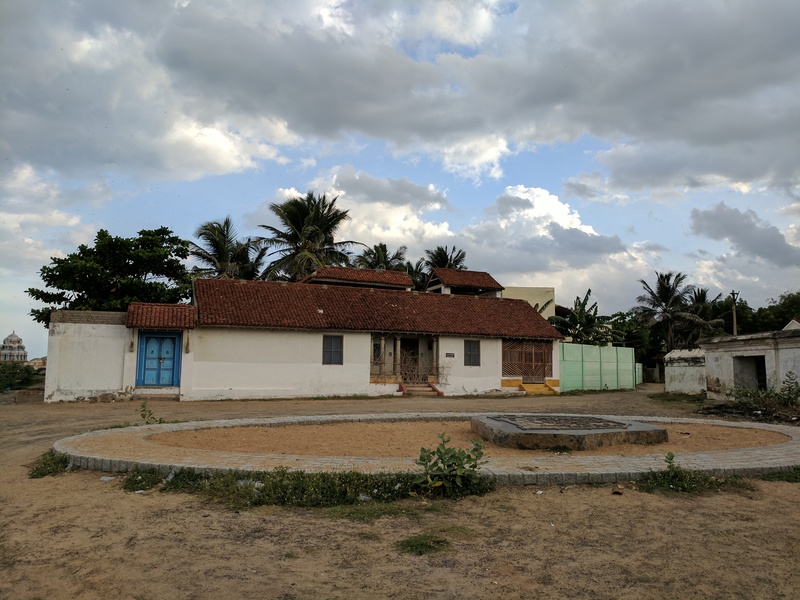 Perhaps, it was because of the sense of emptiness all around in Tranquebar — locked and empty houses and mansions, near empty streets and the beach, etc. Except for my first evening at Tranquebar, when the beach was crowded thanks to Ganesh visarjan, I saw only a handful of people on the other days. Friends who had visited Tranquebar had told me that it was a quiet and relaxed place, but no one had told me just how empty it would be. It is not that I didn’t see any people; just that it was far emptier than I expected it to be. It was unsettling. On the one hand, there were houses that were literally rotting away, and on the other were these houses and mansions that had been restored with the help of the Danes (see photograph on the left). Both types did not have anyone living in them and from the looks of it, nobody had lived in them for years and, maybe, decades. 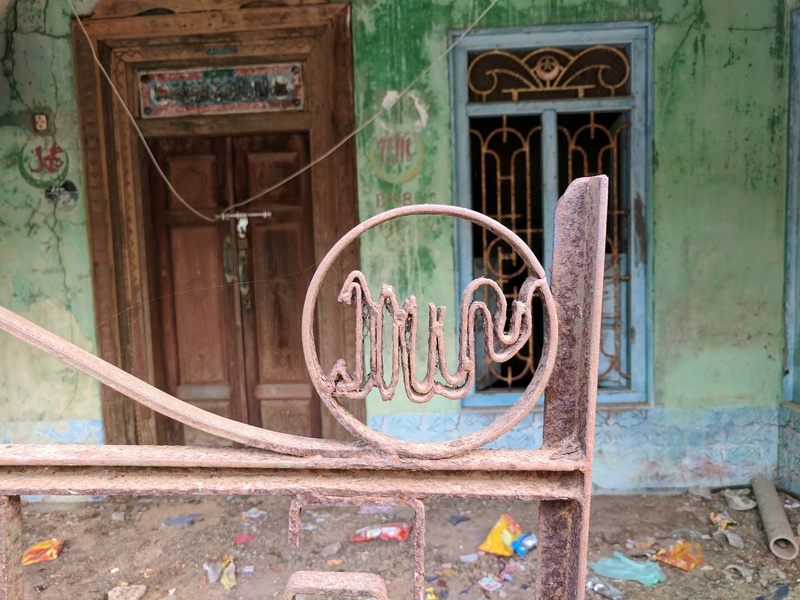 This made me think about heritage and the whole idea of restoration of heritage structures in general and the nostalgia-driven heritage and conservation that is visible in Tranquebar in particular. I am still trying to understand why so many structures have been restored only to be kept under lock and key. Apart from the citadel of Fort Dansborg, the Governor’s House, the Ziegenbalg Press and a couple of other structures, none of the others are in use. The caretakers/watchmen of some of these renovated and locked structures I spoke to said that they might become hotels ! One of them even told me about rumours of a theme park coming up in Tranquebar to attract tourists ! Why can’t we think beyond theme parks and former heritage structures as hotels ? 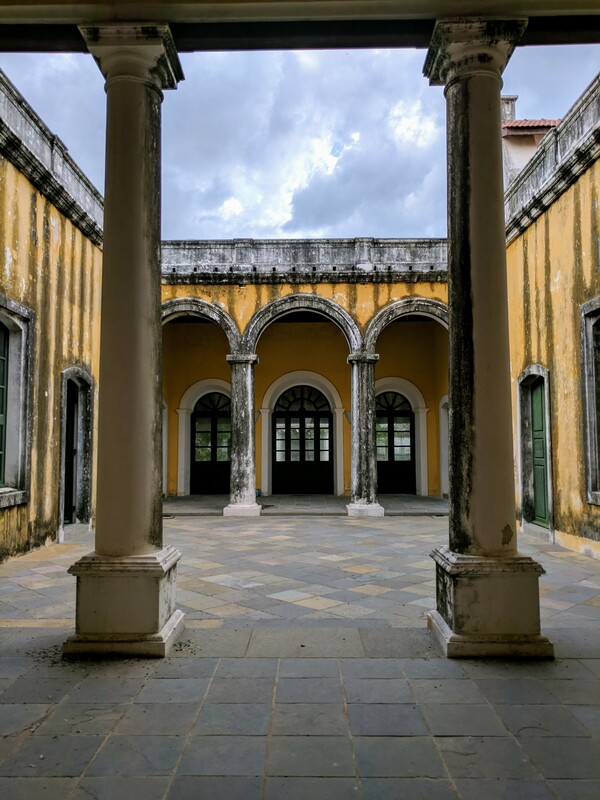 Instead, why can’t Tranquebar play host to artist and writer residencies or why can’t there be literary, theatre, dance, music and art festivals? Tranquebar represents a unique piece of the history of the Coromandel Coast as well as larger Indian history, and one that needs to be preserved for the generations to come. However, the idea of conserving heritage for the sake of nostalgia or just because it has to be done, is not the right way to go about it. Heritage has to be sustainable and relevant for both the locals and tourists alike. Have you explored Tranquebar? I would love to hear your thoughts on the place. Though Tharangambadi is the official name of Tranquebar, I have chosen to use the latter name as it is better known. 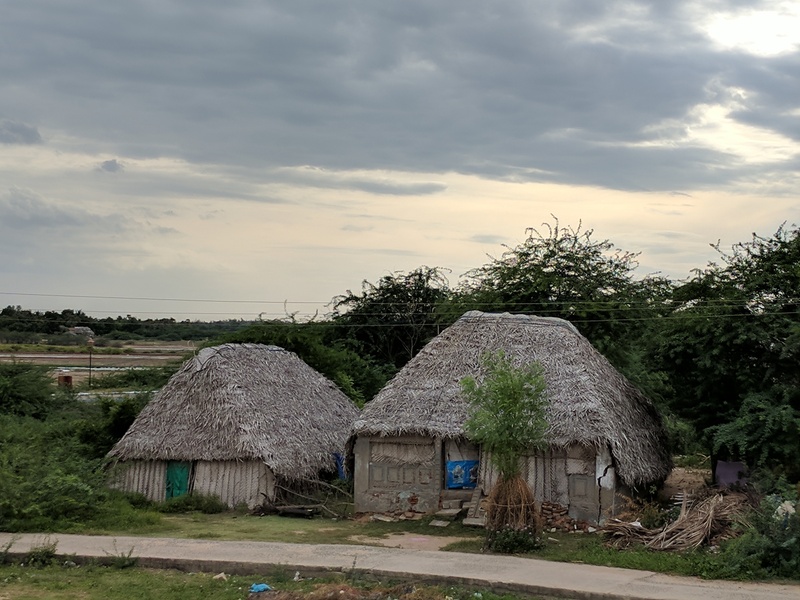 If you choose to stay at Tranquebar and explore it (and I really hope that you do), then may I recommend that you stay at Neemrana’s The Bungalow on the Beach? 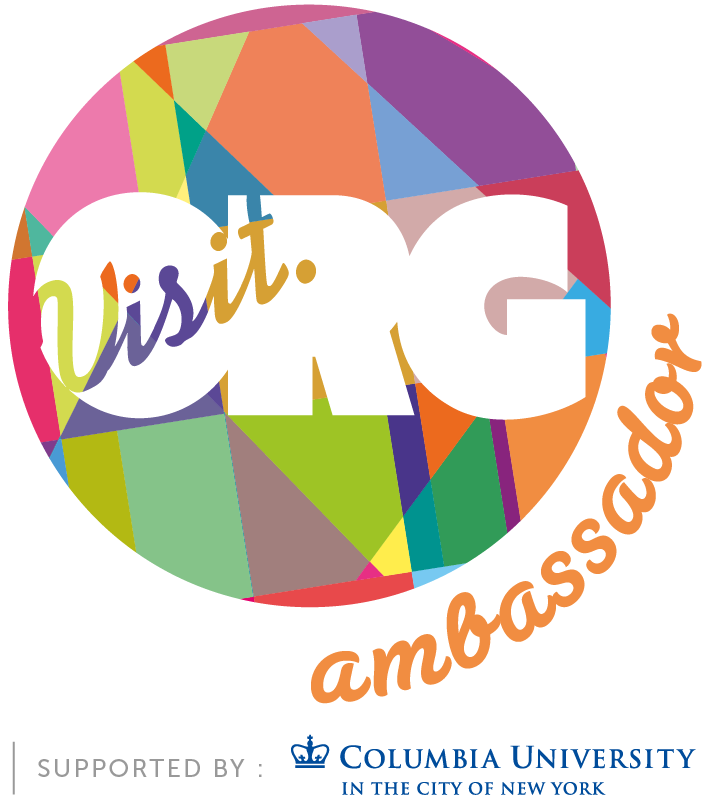 It is such a fabulous place and you won’t regret it. “A Little Piece of Denmark in India” by Kristian Gronseth (2007). “History of the Tranquebar Mission” by J. Ferd. Fenger (1863). 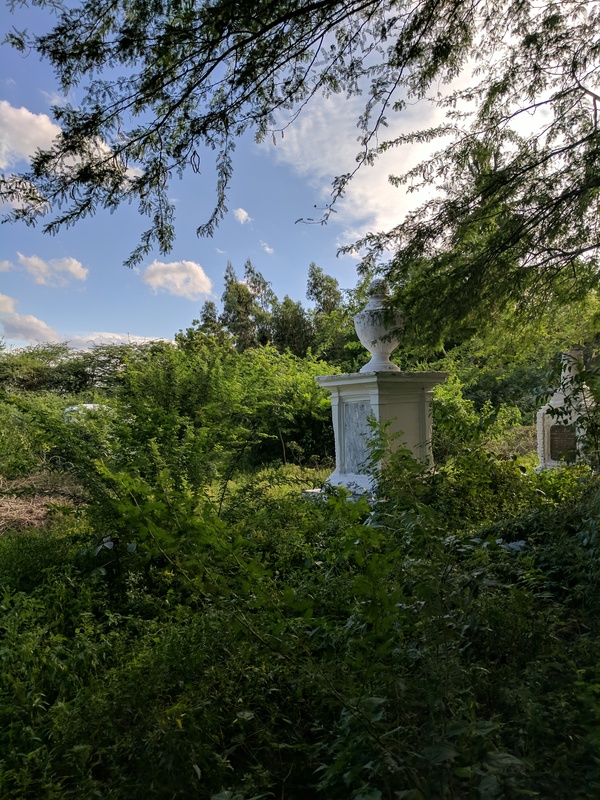 A little enclave I didn’t know about – what a fascinating post. I think you’re right about needing to think beyond hotels and tourists as a use for heritage properties. 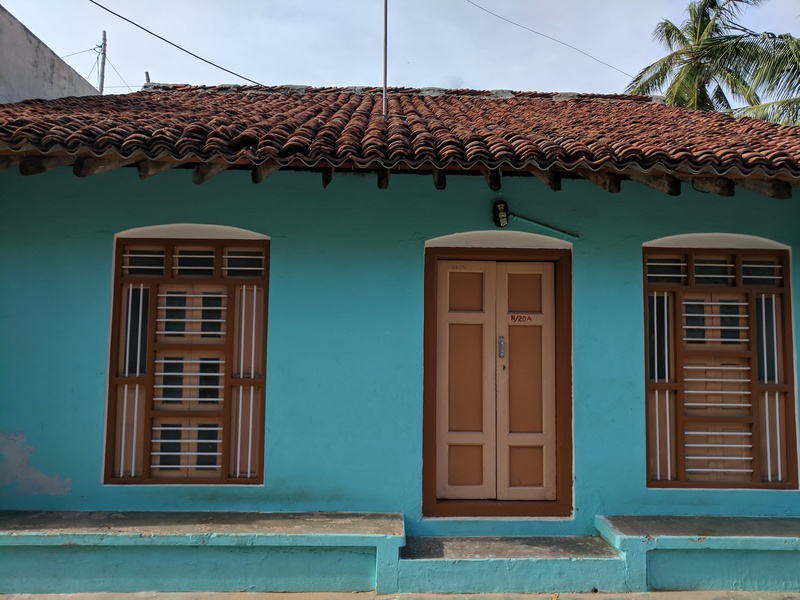 (In Kochi, I found the main tourist area rather uninteresting, preferring the commercial backstreets of Mattancherry and the falooda parlours of Ernakulam. Much more fun.) Artist residences or craft workers’ accommodations would be a much better use – and actually then gives the place a special reason to be visited, rather than just a few more heritage buildings. Or even set up a thoroughly modern work-live village for video arts and technology start-ups, why not? Bangalore can’t have everything! Falooda parlaours of Ernakulam ! I must visit them when I visit Kochi next. I agree with all your suggestions on making the place more interesting and broad based for visitors. And also it would be wonderful for school children to learn and interact with all creative people who would visit, wouldn’t it? What a coincidence that Piya is visiting Tranquebar today!!! Great post on this Danish city and hope to see it someday soon. What a coincidence, indeed. I hope Piya had a good time exploring Tranquebar. Considering the history buff that you are, you will definitely like Tranquebar. Great post on this Danish city and hope to see it someday soon. Thank you, Amer. Hope you get to visit the Tranquebar sooner, rather than later. My feelings resonate with yours. Unless we make these heritage structures part of our community they will continue to be ignored and the efforts to restore will not yield fully. Look at how Pondicherry has become during a span of 20 years. Tranquebar looks equally promising. It can be a great option for writers looking for some quiet time! what do you think? I visited Pondicherry for the first (and only time) in 1997 and even then I was quite appalled at what it was turning into. 21 years later, I’m sure it would only have got worse and not better ! I completely agree with you. Tranquebar has a lot of potential for being a space for artists and writers and it might be a great idea to pitch it as such. I would also love to see these artists and writers engaging with the local community, especially school children. Maybe teach a bit, conduct workshops. Think of what potential this place has. That’s a great thought. Unfortunately, expecting all this from authorities is too much! Such an interesting snippet of history. I’m amazed! Beautiful snapshots. Welcome here, TwoBrownFeet and thank you so much for stopping by and commenting. Yes, Tranquebar is indeed lovely place with a lot of history that many are not aware of. I hope that it continues staying that way without losing its relevance.